Because I am often asked about how characters are created, I decided that it would be fun to tell you about the "real" characters behind the book "Purrlock Holmes and the Case of the Vanishing Valuables". Of course, as is his due, the first one we'll deal with, is that smart aleck, wisecracking feline, Purrlock. Is there a "real" Purrlock? Yes! And no. Cats are not like humans, and we all know that. But they have lots and lots of purr-sonality, and sometimes it almost seems as if they are human. That's why it was so much fun to create a cat character, with the traits of a person, and let him do things that sometimes we as people, might like to do, but can't because we're not allowed. But in the world of fiction, where stories are made to be entertaining, there was lots of room to let Purrlock show his true nature, and sometimes let him be just a little bit bad. So of course, there isn't really a cat detective, except the one that I created. But there is a role model for Purrlock. A role model is someone that we admire and maybe want to be like, because they are good at what they do. The "real" Purrlock Holmes, is one of my own cats. Only his name is "Coolcat". This is his picture at the top of the page, and on the book. 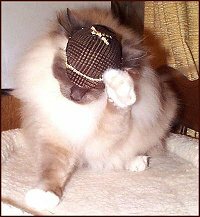 Coolcat is a purebred neutered Birman cat, that I show as often as I have the opportunity. He has a great personality, and has become widely known for his antics in the show ring. If you have never been to a cat show, you should try it sometime! Here is a link to the Cat Fancier's Association, where you can learn all about shows, and find the schedule to see if there is one near you. There is also a downloadable document in .PDF format, which tells all about the ribbons and awards that are given out at a cat show. Cats aren't required to run around or perform tricks. They are judged by a standard, which is a set of rules that tell a breeder how the cat should look, and what its colour should be like, among other things. How a cat acts in the ring, does not earn them any points. But it can be pretty funny. Coolcat is attracted to the poles on the judging table, which have rope wrapped around them. He will climb these and refuse to come down. He will sit in his cage in the judging area, and try to grab ribbons off the cage next to him. And he has been known, while the judge was holding him and explaining to spectators what a Birman cat is, to lean over and kiss the judge. He is just as much a clown at home. Although he is a show cat, he is also my treasured companion. I have often made fun of the vacant "look" on his face, in the lovely portraits I have of him. But actually, when you gaze into those beautiful sapphire blue eyes, there is an intelligence that I wish we could really communicate with. He is an outstanding example of the sweet nature of the breed, giving affection freely, and butting heads with anyone who is available. In the evenings, I know I have been on the computer too long, when he comes to my chair and reaches up to pat me on the arm. This is his signal that he's ready for bed, and I should be, too. If you would like to learn more about the Birman cat, and the wonderful legend behind them, please visit Purrlock's special Birman Breed Portrait.